My first action of the game was to declare that Dark Acolyte charge against the Disciples: they made it in, while a Kraken forced the central footpads to flee due to Terror. With the disciples locked in combat my army pushed up aggressively, careful to stay 26” away from the rightmost dreadmill. The dark raiders to the right spotted a mistake in the vermin deployment and moved up to block the entire vermin battle line and prevent the daemon, the pendulum and the dreadmills from moving forward to threaten me. To the right, the blades advanced behind the hill to avoid getting shot at by the plague catapult. In the magic phase the Ice and Fire attempt on the right dreadmill was dispelled, allowing me to cast both the Breath of Corruption on the Yema champion and a Deceptive Glamour on the Vermin Hulks to deter any long turn 1 charges vsthe right blades, and gave +1 movement to the Prince in the process. In combat the Acolytes ward saved the automatic toxic hits, and proceeded to kill all but one disciple. The last survivor fled and was cut down in pursuit. Unfortunately, the double 6 I got for pursuit meant that the acolytes ran a bit too far forward and wouldn’t be able to charge the left plague catapult on turn 2. To my astonishment, my adversary chose not to charge the blocking dark raiders, opting for a more conservative approach. The fleeing footpads rallied on their own, and the pendulum unit reformed a bit. The left dreadmill cleverly maneuvered behind the impassable terrain, spotting the corner of my corsairs, and thus able to shoot at the accompanying prince without risking a countercharge. The second dreadmill was pushed up the hill to frenzy-bait the Blades of nabh and the rest of the army maneuvered slightly. Magic was largely ineffective this turn: the blocking Dark Raiders got hit by an Unerring Strike, but only suffered a single wound. A small Fate’s Judgment on my nearest Kraken was armour saved and then I then dispelled the 2d6 S4 hereditary with my dice. 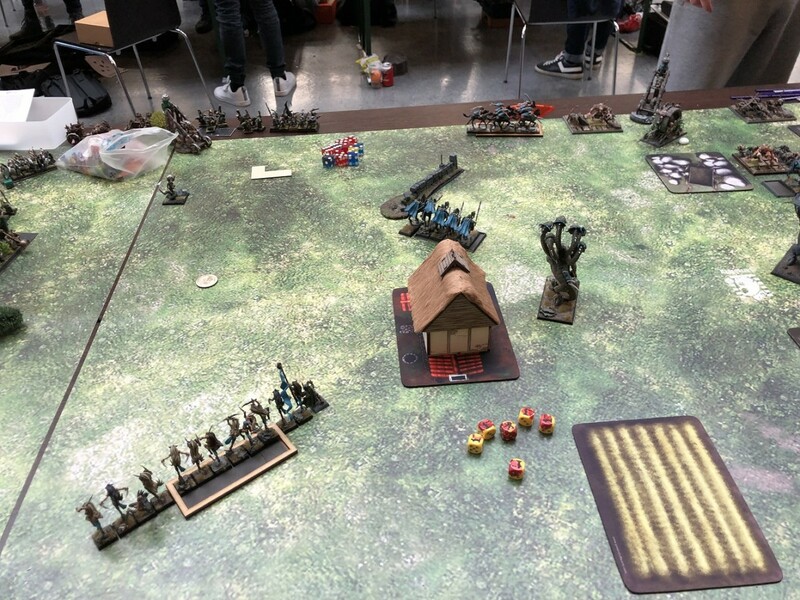 Shooting was a totally different business, though: the Dreadmill shot at the corsairs, failed to wound the Prince with its one allocated hit, but both Plague Catapults hit the corsairs, killing the entire unit outright. The right dreadmill put a couple of wounds on the medusa and the footpads killed two Blades of Nabh. 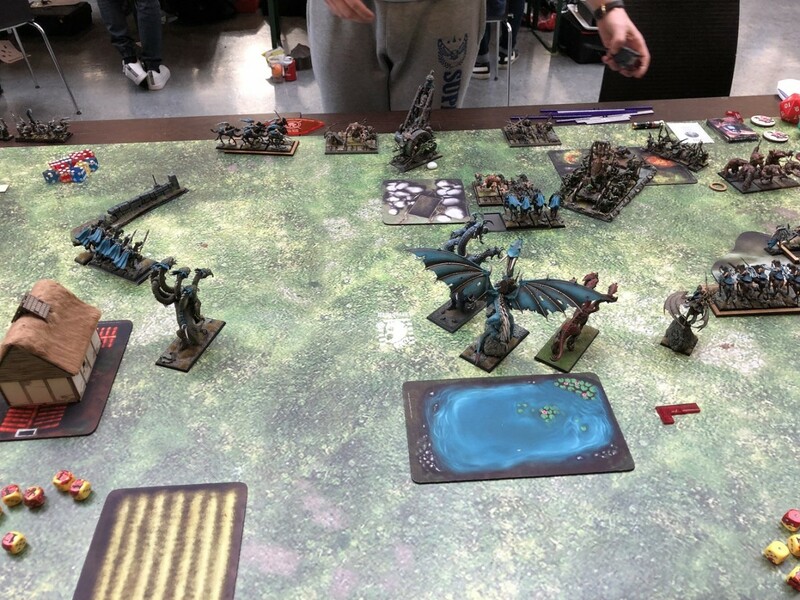 The Blades failed their frenzy check, making decisions easier for me: they went into the right dreadmill, while the leftmost kraken forced yet another terror check on the central footpads and made them flee yet again. The right medusa made a charge into the closest footpads, hoping to deal with at least one of the scoring units on that flank. The left Dark Raiders pushed them off the board, inducing a couple of panic checks on the nearby Giant Rat units, but both were passed. The failed frenzy check kind of forced my hand: I knew that one Dreadmill would be occupied for at least a turn, and the other would have to choose between three krakens, a Manticore or the Prince. So all of the hard hitters rapidly relocated east, ready to charge on the following turn. The yema acolytes performed an outflanking maneuver, moving in a position out of the Dreadmill’s arc of sight. 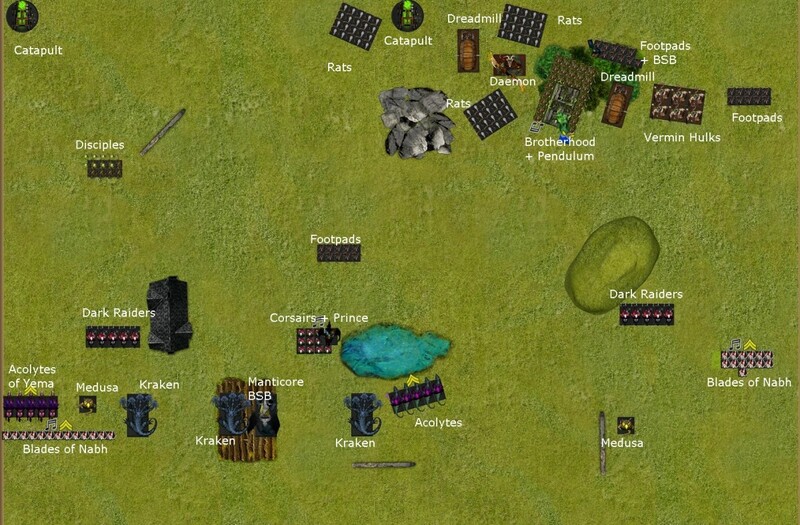 The other acolyte unit moved on top of the hill so as to support the blades in the coming dreadmill fight. 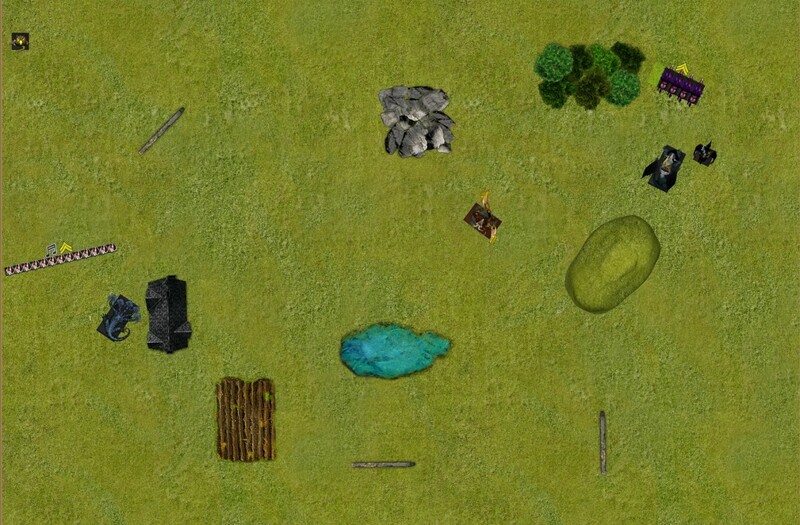 In magic I started by casting a grave calls on the rightmost Dreadmill, which got dispelled. Then the crippling fatigue on the other dreadmill promptly got dispelled as well. The yema acolytes settled for a Breath of Corruption, which put a single wound on the right dreadmill. In combat the Medusa dealt 4 wounds for none back, but the footpads held on their steadfast break test. 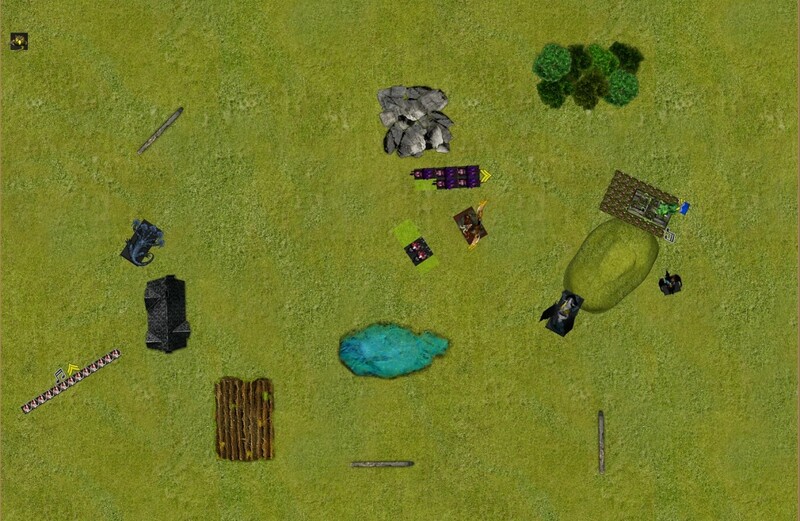 The Blades went first against the Dreadmill, and dealt six wounds, aided by their poison attacks and hatred: my adversary kindly failed 5 out of 6 4+ saves, and proceeded to remove the dreadmill from play, still astonished. The blades reformed 8-wide and prepared for the incoming Vermin Hulk countercharge. 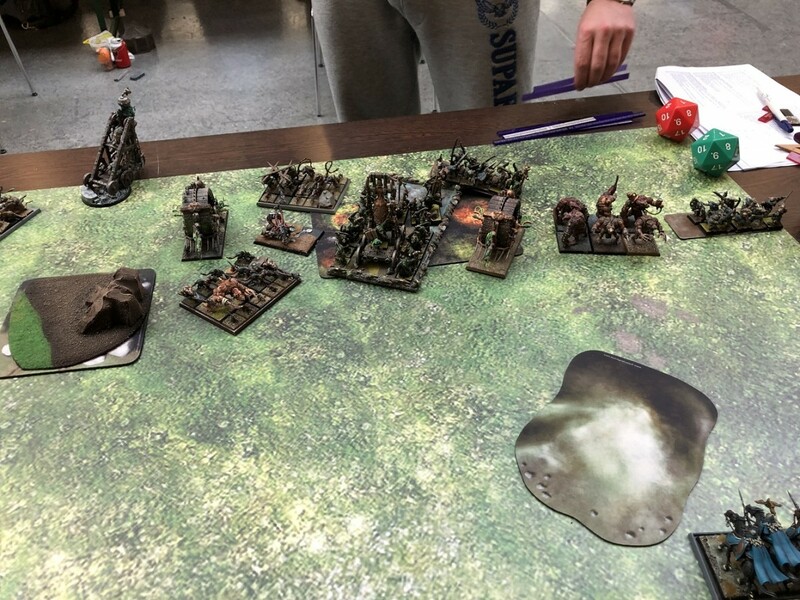 The vermin went on the counterattack: the Hulks fell upon the victorious Blades, and this time the Plague Brotherhood charged my blocking Dark Raiders. The pendulum took a wound from Dangerous Terrain going in. The dreadmill stayed behind the impassable, and the Vermin Daemon maneuvered along with the rest of the vermin units. A unit of Giant rats moved up to block my two kraken. Magic was largely inefficient: I let through the Hand of Glory on the pendulum, then dispelled two damage spells cast on the right Acolytes. Shooting saw the dreadmill deal 3 wounds to my leftmost kraken, while the catapults failed to deal any damage to my yema acolytes. In combat the Footpads managed to deal the last remaining wound to the Medusa. The Pendulum predictably wiped out the Dark Raiders and reformed to face my flyers. Meanwhile, in the big fight the Blades got to strike first: with their 28 attacks they managed a whopping 13 wounds to the vermin hulks! 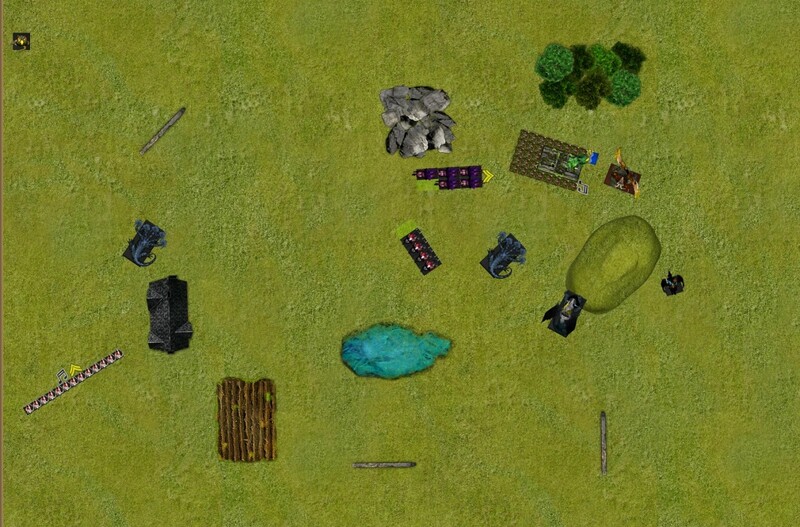 One successful armour save later, four hulks lay dead before they even got to strike. My joy was short lived, as the two remaining hulks rolled perfectly and killed 10 Blades, leaving just the champion alive. They lost combat by 2, but held thanks to the Vermin Daemon’s proximity. The yema acolytes declared a charge on the Giant Rats’ flank, with a clear overrun path into the catapult right behind. The medusa to the left charged into the second catapult, and the other acolyte unit fell upon the two remaining Vermin Hulks’ flank. The kraken and manticore all fell on the blocking giant rats, but failed to panic them. The Pegasus Prince relocated behind the hill and within striking distance of the enemy scorers, trying to draw attention away from the krakens if possible. In the magic phase the Yema acolytes managed to cast the Grave Calls on the dreadmill, despite my opponent’s dispel efforts. The vermin contraption took four unsaved wounds and died! They then also cast Breath of Corruption on themselves, to help out with the ensuing Giant Rat fight. That combat went really well, and the acolytes won combat and broke the rats (both BSB and Vermin Daemon were too far to help out with Discipline). They overran into the catapult right behind. The medusa performed admirably against the other catapult, breaking it in combat. The charging acolytes dealt enough wounds to the Vermin Hulks to kill them instantly, and pivoted to face the Vermin Daemon right across from them. Finally, the kraken duo broke the giant rats and caught them in pursuit: one of the krakens overran straight into the Pendulum unit, pinning it in place. The previous turn was catastrophic for the vermin, seeing the destruction of both dreadmills and a shift in power balance on the right flank. 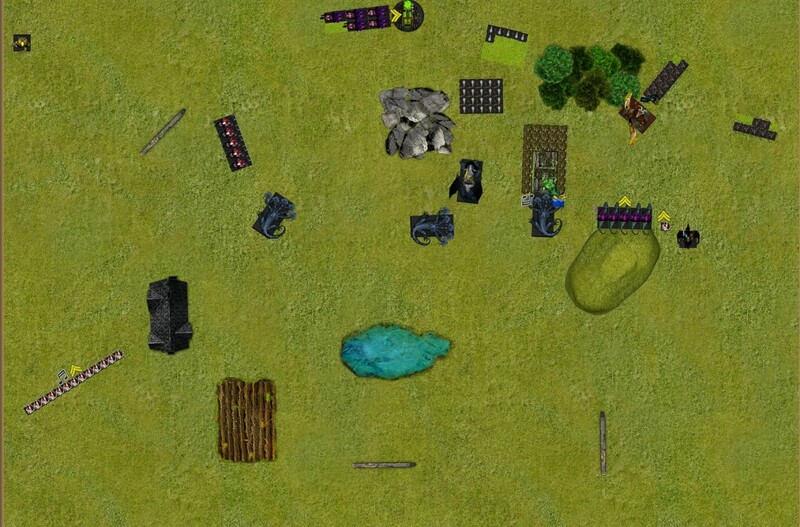 Both catapults were also dealt with, leaving essentially just the vermin daemon, the plague pendulum and some small scoring units. 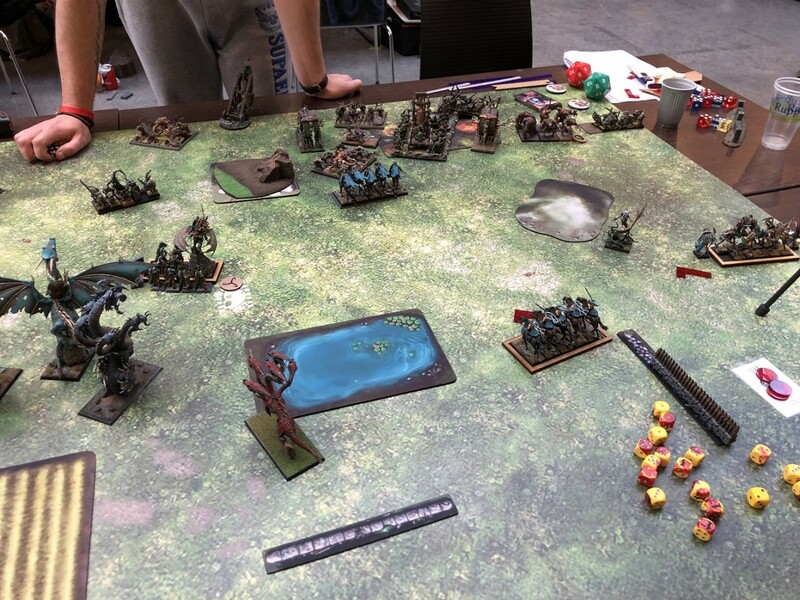 My opponent threw the vermin daemon into the Acolytes, and I opted to hold the charge out of fear of a charge redirection into the single Blade: that would allow the vermin daemon to overrun into my prince right behind without any chance of reaction on his part. So the Acolytes took one for the team! 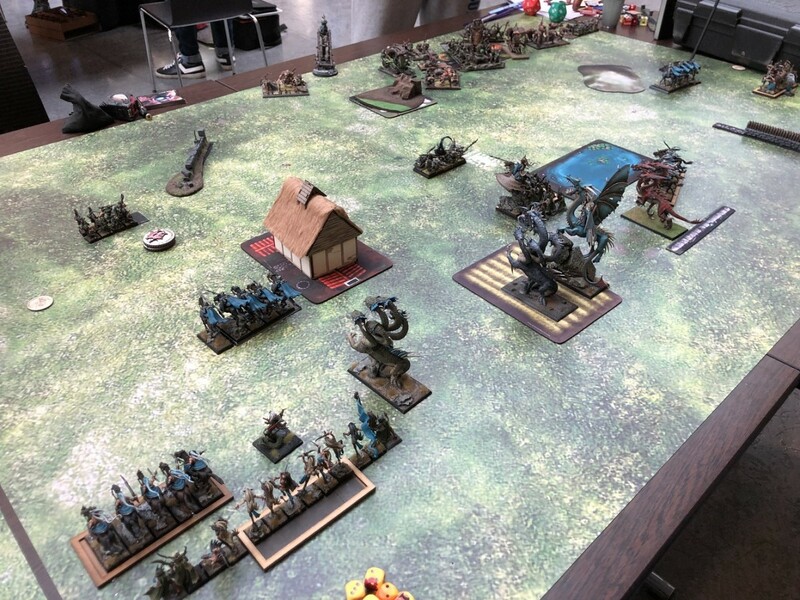 The footpads attempted a long charge against the lone blade, hoping to get rid of her and pin the Pegasus Prince right behind her with an overrun: fortunately for me, they failed the charge and just stumbled forward. In magic my priority was to dispel the Stars Align on the Vermin Daemon, so I had to let through the Pentagram of Pain aura -which killed some rats/footpads, my last blade of nabh and two of my Acolytes- as well as the Hand of Glory on the pendulum itself. Close combat started with the Kraken failing to get past the pendulum’s 3++ aegis save, and getting killed instantly for its troubles. The pendulum unit reformed to face my other kraken and manticore. The Vermin Daemon struck first against my acolytes and killed two, leaving the unit champion alive. He retaliated and put a wound on the vermin general: thanks to the general’s proximity the caster held his ground. The Yema Acolytes killed the catapult for no casualties back, and forced the nearby giant rats to flee off the table in panic. 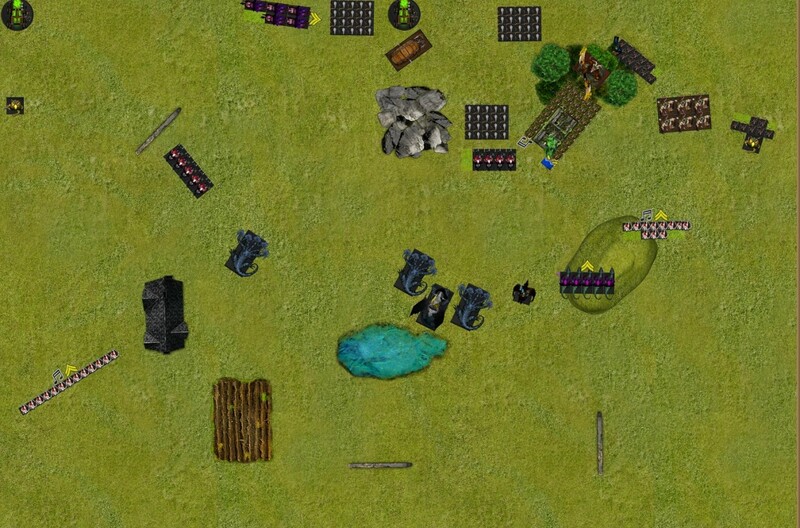 The dread prince spotted the BSB’s footpads and charged them, making it in. The rest of the mobile DE forces elected to maneuver this turn, getting in better positions for the endgame: both the kraken and the manticore moved past the pendulum unit and in position to threaten the vermin daemon, and the Yema Acolytes did the same. 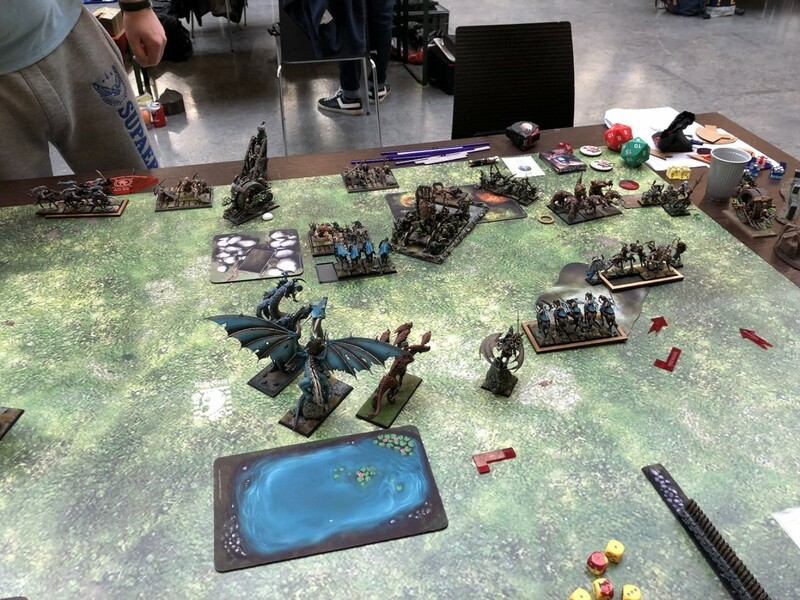 The dark raiders moved in range to frenzy bait the Pendulum, hoping to pull it away from where all the action would be in the last couple of turns. 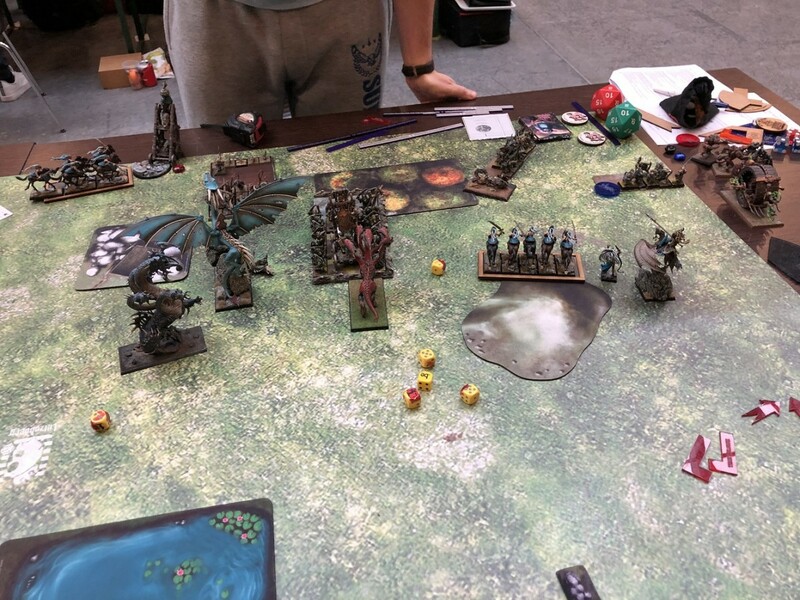 In the magic phase the Breath of Corruption was cast on the Yema champion, and then in a 5 vs 5 roll I also managed to cast the Grave Calls on the unengaged footpads who could contest the objective: four of them died, leaving two, who were then finished off by the breath of corruption. Combat went really well for the Elves now: the acolyte champ dodged all of the Vermin Daemon’s attacks, and proceeded to put another wound on it, winning combat! The VD held easily, but that meant that I’d be safe from the monstrous rat’s spells and attacks for another turn. 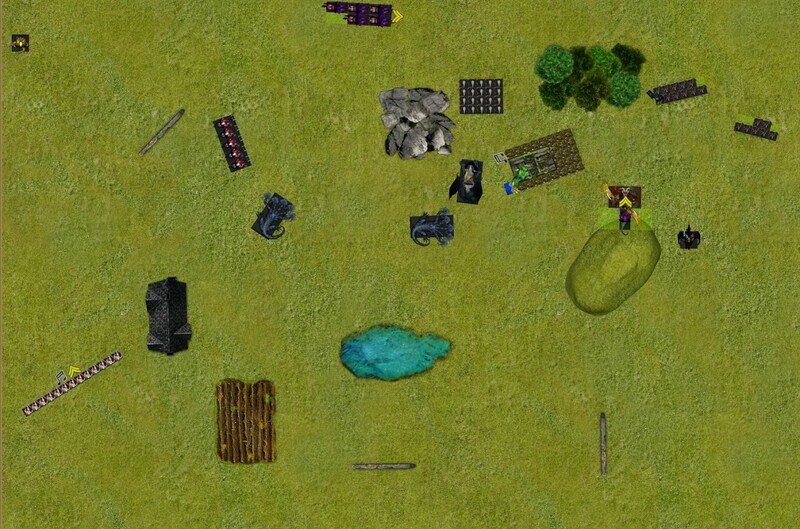 My prince killed the Chieftain BSB in combat, his Pegasus dealing a couple more wounds on the footpads. Without the BSB to keep them in line, the remaining rats fled off the table, freeing up my prince. The last remaining giant rat unit spotted my Kraken’s flank and proceeded to charge it, clipping its corner. The Pendulum unit passed its frenzy check and opted to reform towards the east flank, staying out of arc of my manticore and acolytes. In magic I let the Hand of Glory through once more, then dispelled Pentagram of pain. Combat saw the daemon finally slay the acolyte champion, then reforming to face the Pegasus Prince. The Kraken won against the rats but they held. 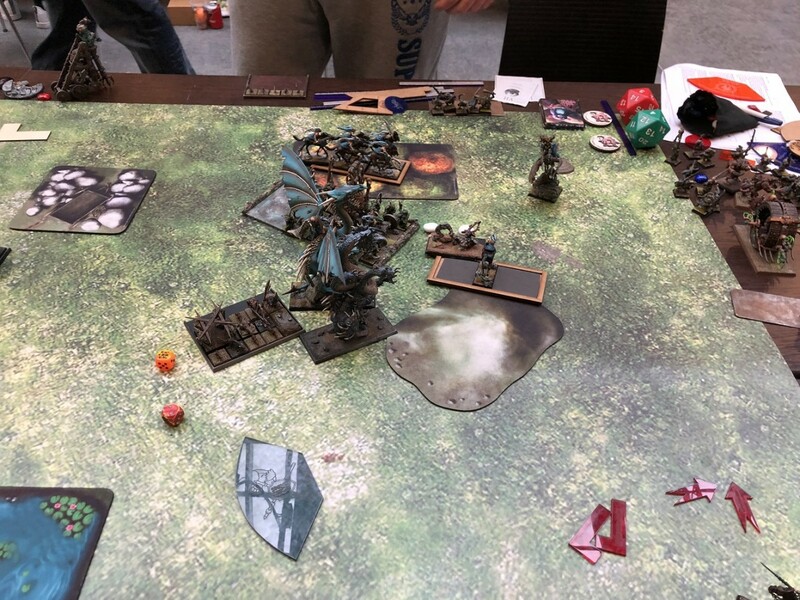 Last turn’s events had given me a shot at killing the vermin daemon: the Pegasus prince could combo charge with the BSB, getting a static combat resolution of 4 and a chance at dealing multi-wounds to the big guy. However, there was a serious chance I’d lose my general and potentially even the BSB if I did so. So instead, I elected to just maneuver around the two remaining vermin swarm units and use my charge range to deter any last-turn moves on top of the objective. In magic the Breath of Corruption failed to wound the Vermin Daemon and the Grave’s Call was dispelled. 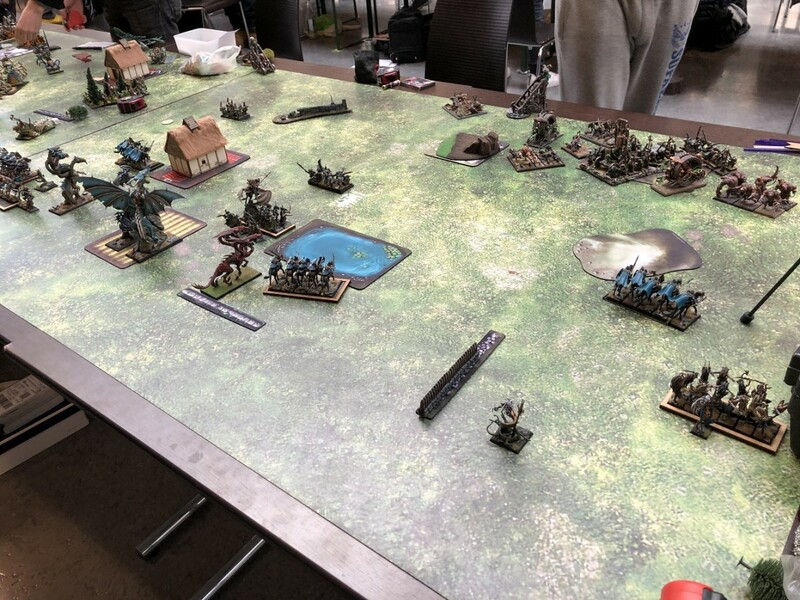 The Giant rats managed to deal two wounds to the Kraken before they had to flee from it: the monster reformed and a single rat survived the dangerous terrain checks and landed next to the table edge: it would fail to rally on the following turn and flee off the board. With no charges available this turn, the pendulum advanced towards the objective, giving my units its flank and rear. The vermin daemon backpedaled and positioned for turn 6 countercharges. In the magic phase I dispelled the Hand of Glory on the Brotherhood, which unfortunately left my opponent with enough dice to cast both Fate’s Judgement and Unerring Strike on my Kraken, finally killing it. On the last turn of the game, the objective was to keep the Brotherhood away from the Secure Target token: so the Manticore and the Pegasus charged the unit’s flank, with the Acolytes going into its rear. The two remaining dark raiders stepped in front of the vermin daemon to prevent any countercharges. The vermin Daemon did try to force them to flee due to terror, but failed. The only thing that mattered now was that combat, where the Dread Elves managed to kill the brotherhood to a rat, leaving just the Pendulum standing. The last roll of the game was the Pendulum’s Stubborn Discipline 9 test, which was failed. The Plague Pendulum fled and was cut down, leaving just the Vermin Daemon standing. 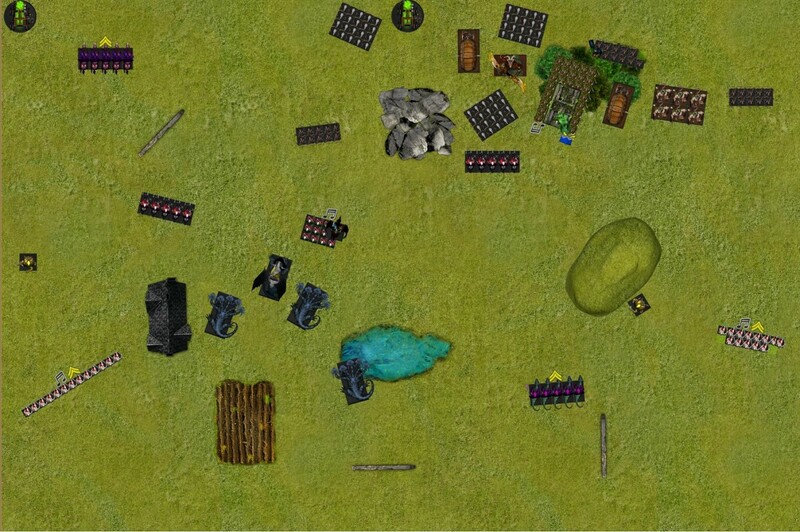 When we tallied up the points, the game ended up being a 17-3 victory for the Dread Elves! i) The deployment of the plague disciples that allowed me to deal with them without any losses on turn 1. I hate disciples because if I have to face them in a straight fight they often give as good as they get, and end up crippling a monster or another combat unit. Killing them opened up the flank and let the Yema Acolytes roam free. 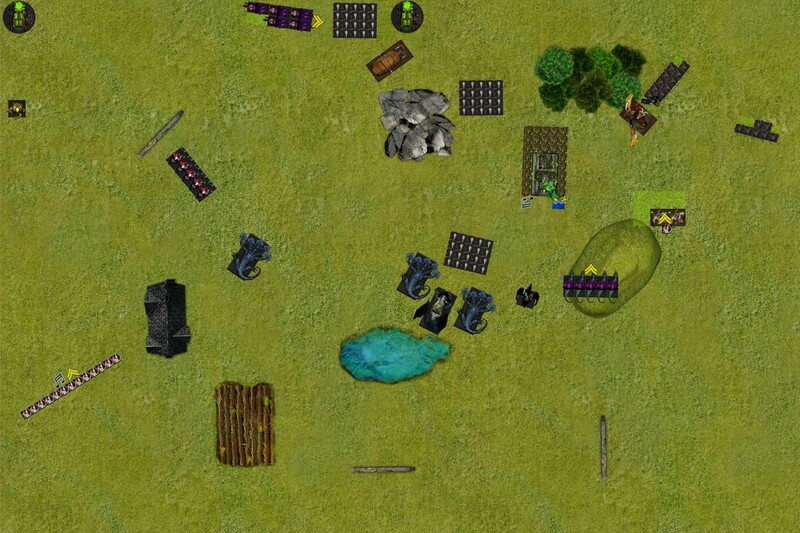 ii) The Blades’ performance: Not only did they automatically kill the Dreadmill, but they also crippled the Vermin Hulks, severely weakening the right flank. My opponent rightly pointed out that the odds of them killing the Dreadmill were low, but in reality it wasn’t all that much above what’s expected on average. Overall, this tournament has convinced me of the value of the Blades of Nabh when you make sure that they can fight their intended targets. iii) The Yema Acolytes’ killing spree. 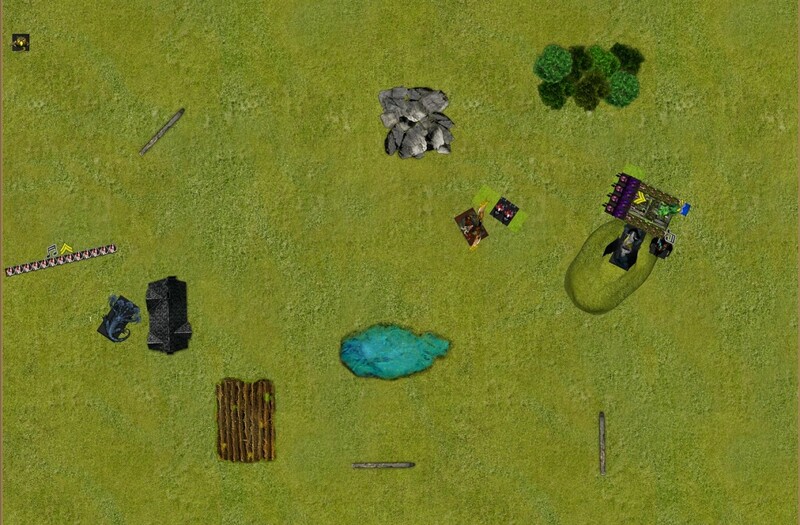 They dealt with the following: Plague Disciples, 2 units of Giant Rats, 1 Dreadmill, 1 Catapult, a unit of footpads and helped kill the Plague Brotherhood and run down the Pendulum. Definitely the Elves of the match! It would be a lie if I said that luck didn’t play a part in this: I took every opening that my opponent gave me, and most of the time the gambles worked out fine. In a game like this, playing it safe would always result in a small loss to the dread elves because the vermin have the ranged advantage and the ability to deal with a monster per turn: so I figured that my only chance was to put the pressure on, try to keep the daemon and pendulum occupied and the Dreadmills apart so that they couldn’t focus on a single target. 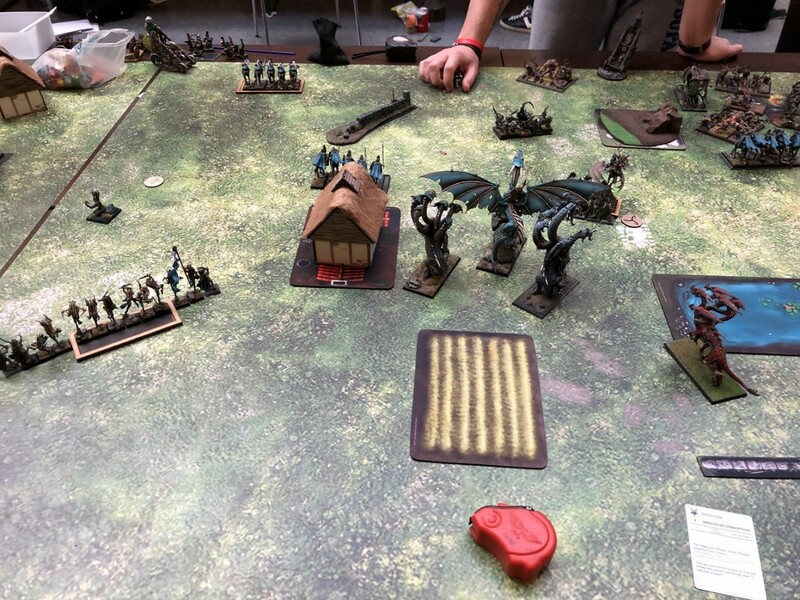 When discussing the game with Thibault, he mentioned that he wasn’t expecting me to push like I did, especially after we ended up with what was essentially a denied flank deployment each. 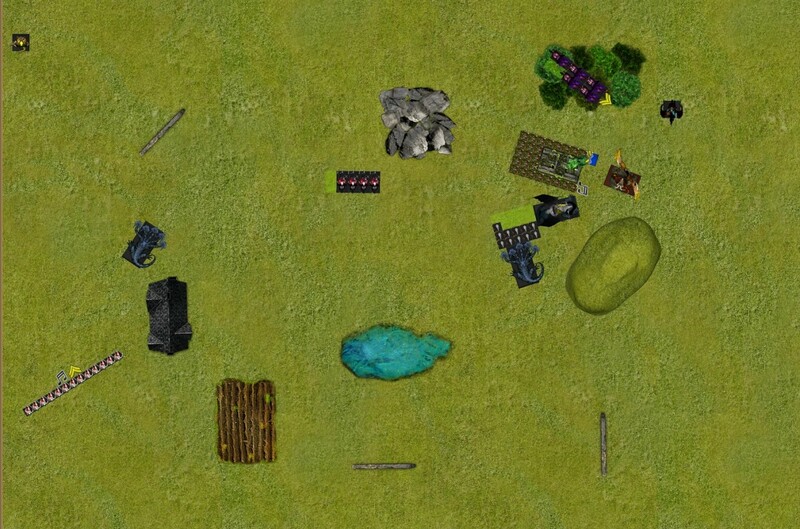 This highlights one of the biggest strengths of the army, the ability for rapid redeployment and lateral movement: within two turns, the bulk of my forces were back in the game and kept the vermin battleline occupied while the flanking forces took care of scorers and got points left and right. This was an exciting game and I thank @ANKOR for it: I’m hoping that in the future this blog will feature a rematch! Unfortunately for our team, the rest of the games didn’t go exactly as planned and we lost the round 40-60, getting pushed off the podium and finishing in 5th place out of 20 teams (places 2-5 were all within 5 tournament points of one another). Still, a very respectable result given the quality of the teams present and the very hard-fought final round! Overall, the tournament was a great experience: as I’ve noted before, the TO did a great job and we’ll be certainly back next year. I hope that the event keeps growing even more and that our friends from the FLUFFF organization won’t get tired of hosting this amazing two-dayer. 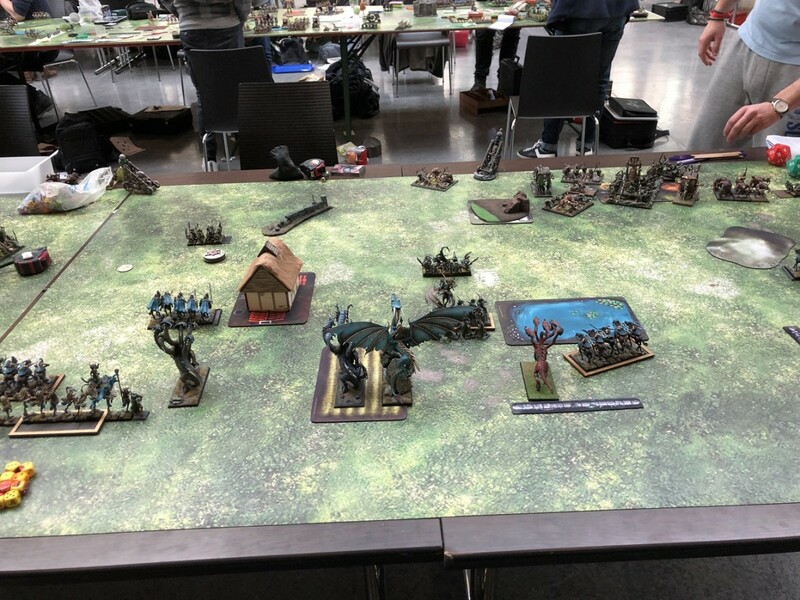 I hope that you enjoyed this tale, this will probably be the last tournament report series before the ETC so hopefully you’ve had your dose of T9A goodness to last you until then! I’m enjoying very much! It’s a pitty this is the last one... for now, I hope. Amazing battle and report! Which army will you take to ETC? This hasn't been decided yet. Depending on the composition of our team it might be the Sylvans (with a list like the one featured in the Lille tournament reports) or the monster mash Dread Elves that you saw here. Both lists offer the tools needed to create opportunities in-game, so it will be a tough choice to make!